Abu Dhabi Island hosts a number of reptiles but no survey has yet been undertaken and a complete list does not exist. The occasional sea snake has turned up dead on local beaches and they are sometimes observed swimming; land snakes do not appear to be in evidence on the Island. The odd lizard is seen -- Umm an Nar seems to be a haven -- but by far the most common reptiles noticed in town are geckos. Among these latter are a couple of interesting species. This is a small, agile gecko with an English name derived from its normal habitat on or near rocky areas and cliffs. In Abu Dhabi, it is found on walls living in small cracks and crevices. Active by day, it makes rapid rushes to pick up ants and other small insects. When confronted with one of its own species, it sometimes swings its tail from side to side or raises it vertically. 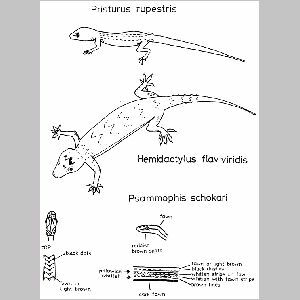 The Dwarf Rock gecko is light fawn in color apart from its whitish undersides. There is a series of reddish/maroon broken lines along its body, and blotches of the same color where the limbs join the body. The pupil is round and black and a reddish ring surround the eye, which has a dark facial stripe running through it. The tail has an apparent fringe on upper and lower edges, being slightly compressed in the vertical plane. Body and head combined are usually shorter than the tail. This is a larger gecko seen throughout the year except on cool and wet evenings. It can be observed on walls and ceilings of older buildings, around lights at night or more rarely in shady positions during daylight. It retreats from sight as the morning warms up. Very occasionally it is seen on trees (British Embassy garden, 1977). This gecko has an olive-yellow skin on its upper surface with a series of brown zigzag transverse stripes edged with white. The underside is white. The ear opening is large and the pupil vertical. Distribution*: Bred Sea Coast, Arabia, and Iran to N. India and Bombay north of 20'N. Probably an oriental gecko spread accidentally via human trading activities.